UWA engineering graduates (l-r) Joshua Perling, Dagogo Altraide and Jonathan Luu. Photo: Attila Csaszar. 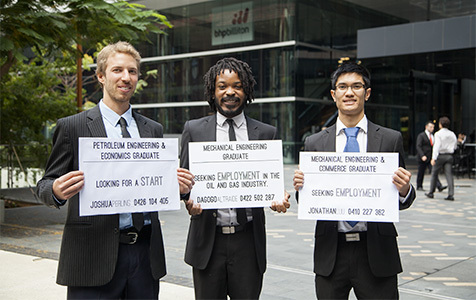 Frustrations over not being able to find a job has led University of Western Australian engineer graduates to take to St Georges Terrace advertising their availability for work. I would like the opportunity to speak with individuals who are willing to put themselves out there as these gentlemen have. This shows creativity, responsiveness, courage and teamwork; these are all characteristics we look for in graduates. In a market where businesses are receving applications, equal to the thousands of students that attend career fairs, I think the approach is refreshing. While I'm not saying that there isn't a risk in connecting desperation with your personal brand, these individuals have also provided employers with an insight into what students are up against. ... of course, while they hold their personal advertisements, we can always walk on by. Try doing a Degree, once you know what you want, and get experience, min 5 years, in something practical, then take your degree, it will be easier because you already have experience in your subject, and then employers will see you as a good prospect. As one of the three graduates involved in the article I would like to clarify why we have gone about this novel method of job seeking. Firstly we were genuinely interested in the idea as a form of social experiment; and were very impressed by how much passers by were willing to devote their time and knowledge to helping complete strangers. We also saw it as a perfect opportunity to improve our soft networking skills and confidence in a business (albeit informal) environment. Lastly it was meant as a bit of fun and a chance to capitalise on our circumstances, which are familiar to the current generation of university graduates. We have not thought of our actions as a direct method to get work; rather a way to gather direction in the same way as a river does not seek to start all at once, but forms through the joining of many streams.